The towers burn shortly after United Airlines Flight 175 crashed into the South Tower on the right. On the left is the still smoking North Tower, struck earlier by American Airlines Flight 11. 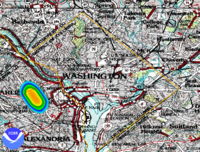 Target(s) World Trade Centre and The Pentagon (fourth hijacking was probably aimed for the White House or the U.S. Capitol). The September 11, 2001 attacks (often referred to as 9/11—pronounced "nine eleven") consisted of a series of coordinated terrorist suicide attacks by Islamic extremists on the United States on September 11, 2001. The victims were predominantly civilians. On the morning of September 11, 2001, nineteen terrorists affiliated with al-Qaeda hijacked four commercial passenger jet airliners. Each team of hijackers included a trained pilot. The hijackers crashed two of the airliners ( United Airlines Flight 175 and American Airlines Flight 11) into the World Trade Centre in New York City, one plane into each tower ( 1 WTC and 2 WTC). A third airliner ( American Airlines Flight 77) was crashed into the Pentagon in Arlington County, Virginia. Passengers and members of the flight crew on the fourth aircraft ( United Airlines Flight 93) attempted to retake control of their plane from the hijackers; that plane crashed into a field near the town of Shanksville in rural Somerset County, Pennsylvania. In addition to the 19 hijackers, 2,973 people died; another 24 are missing and presumed dead. Four commercial airliners were hijacked en route to California from Logan International, Dulles International, and Newark airports. Each of the airliners had a jet fuel capacity of nearly 24,000 U.S. gallons (91,000 liters) or 144,000 pounds (65,455 kilograms). Two of the airliners were flown into the World Trade Centre, one each into the North and South towers, one was flown into the Pentagon, and the fourth crashed near Shanksville, Pennsylvania. American Airlines Flight 11, a Boeing 767-223 wide-body aircraft, crashed into the north side of the North Tower of the World Trade Centre (WTC) at 8:46:30 a.m. local time ( Eastern Daylight Time, 12:46:30 UTC). United Airlines Flight 175, a Boeing 767-222, crashed into the South Tower at 9:02:59 a.m. local time (13:02:59 UTC), an event covered live by television broadcasters and amateur filmers from around the world who had their cameras trained on the buildings after the earlier crash. American Airlines Flight 77, a Boeing 757-223, crashed into the Pentagon at 9:37:46 a.m. local time (13:37:46 UTC). United Airlines Flight 93, a Boeing 757-222, crashed in a field in southwest Pennsylvania just outside of Shanksville, about 150 miles (240 km) northwest of Washington, D.C., at 10:03:11 a.m. local time (14:03:11 UTC), with parts and debris found up to eight miles away. The crash in Pennsylvania resulted from the passengers of the airliner attempting to regain control from the hijackers. During the hijacking some passengers and crew members were able to make phone calls using the cabin GTE airphone service. They reported that several hijackers were aboard each plane. The terrorists reportedly took control of the aircraft by using knives and box-cutter knives to kill flight attendants and at least one pilot or passenger. There were a number of reports from callers aboard the hijacked aircraft that suggest the hijackers murdered several people aboard the planes before impact including the captain of Flight 11, John Ogonowski. Some form of noxious chemical spray, such as tear gas or pepper spray, was reported to have been used on American 11 and United 175 to keep passengers out of the first-class cabin. Bomb threats were made on three of the aircraft, but not on American 77. According to the Commission Report the bombs were probably fake. The 9/11 Commission established that two of the hijackers had recently purchased Leatherman multi-function hand tools. On United Airlines Flight 93, black box recordings revealed that crew and passengers attempted to seize control of the plane from the hijackers after learning through phone calls that similarly hijacked planes had been crashed into buildings that morning. According to the transcript of Flight 93's recorder one of the hijackers gave the order to roll the plane once it became evident that they would lose control of the plane to the passengers. Soon afterward, the aircraft crashed into a field near Shanksville in Stonycreek Township, Somerset County, Pennsylvania, at 10:03:11 a.m. local time (14:03:11 UTC). The 9/11 Panel reported that captured al-Qaeda leader Khalid Shaikh Mohammed said that Flight 93's target was the United States Capitol, which was given the code name "the Faculty of Law." The attacks created widespread confusion across the United States. Unconfirmed and often contradictory reports were aired and published throughout the day. One of the most prevalent of these reported that a car bomb had been detonated at the U.S. State Department's headquarters, the Truman Building in Foggy Bottom, Washington, D.C. This erroneous report, picked up by the wire services, was reported on CNN and in a number of newspapers published that day. Soon after reporting for the first time on the Pentagon crash, CNN and other media also briefly reported that a fire had broken out on the Washington Mall. Another report went out on the AP wire, claiming that a Delta 767–Flight 1989–had been hijacked. This report, too, turned out to be in error; the plane was briefly thought to represent a hijack risk, but it responded to controllers and landed safely in Cleveland, Ohio. 2,973 died and another 24 remain listed as missing. There were 2,973 fatalities: 246 on the four planes (no one on board any of the hijacked aircraft survived), 2,602 in New York City in the towers and on the ground, and 125 at the Pentagon.Among the fatalities were 343 New York City Fire Department firefighters, 23 New York City Police Department officers, and 37 Port Authority Police Department officers. An additional 24 people remain listed as missing. World Trade Centre - 1366 people died who were at or above the floors of impact in the North Tower (1 WTC); according to the Commission Report, hundreds were killed instantly by the impact while the rest were trapped and died later. As many as 600 people were killed instantly or trapped at or above the floors of impact in the South Tower (2 WTC). Only about 18 managed to escape in time from above the impact zone and out of the South Tower before it collapsed. An estimated 200 people jumped to their deaths from the burning towers (as depicted in the photograph " The Falling Man"), landing on the streets and rooftops of adjacent buildings hundreds of feet below. To witnesses watching, a few of the people falling from the towers seemed to have stumbled out of broken windows. Some of the occupants of each tower above its point of impact made their way upward toward the roof in hope of helicopter rescue, however; no rescue plan existed for such an eventuality, the roof access doors were locked and thick smoke and intense heat would have prevented rescue helicopters from landing. 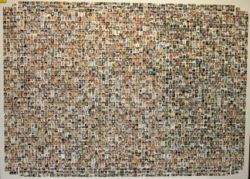 Collection of photographs of those murdered (except for 92 victims) during the terrorist attacks on September 11, 2001. Prosecution exhibit from the trial of Zacarias Moussaoui. Cantor Fitzgerald L.P., an investment bank on the 101st-105th floors of One World Trade Centre, lost 658 employees, considerably more than any other employer. Marsh Inc., located immediately below Cantor Fitzgerald on floors 93-101 (the location of Flight 11's impact), lost 295 employees, including one on Flight 175. Additionally, Marsh lost 38 consultants. Approximately 400 rescue workers, most of them of the FDNY, died when the towers collapsed. According to the Associated Press, the city identified over 1,600 bodies but was unable to identify the rest (about 1,100 people). They report that the city has "about 10,000 unidentified bone and tissue fragments that cannot be matched to the list of the dead." Bone fragments were still being found in 2006 as workers prepared the damaged Deutsche Bank Building for demolition. The average age of all the dead in New York City was 40. The dead included 8 children: 5 on American 77 ranging in age from 3 to 11, 3 on United 175 ages 2, 3, and 4. The youngest victim was a 2 year-old child on Flight 175, the oldest an 82 year-old passenger on Flight 11. In the buildings, the youngest victim was 17 and the oldest was 79. As the suburbs around New York City learned of the destruction so close to home, many schools closed for the day, evacuated, or were locked down. Other school districts shielded students from watching television because many of their parents held jobs in the World Trade Centre towers. In New Jersey and Connecticut, private schools were evacuated. Many children in schools of Maryland, those nearest to DC, were sent home. Scarsdale, New York schools closed for the day. In Greenwich, Connecticut, about 20 miles north of the city, hundreds of school children had direct ties to victims of the attacks. Greenwich and nearby New Canaan, two of the wealthiest towns in the area along with neighboring Darien, had more residents killed, as a percentage of total population, than any other Connecticut towns. After New York, New Jersey was the hardest hit state, with the town of Hoboken sustaining the most fatalities. Almost all the massacred were civilians, except some of the 125 victims in the Pentagon. There were also a number of reports, some contradictory, from callers aboard the hijacked aircraft that suggest the hijackers murdered several people aboard the planes before impact. In addition to the 110-floor Twin Towers of the World Trade Center itself, five other buildings at the World Trade Centre site, including 7 World Trade Centre and the Marriott Hotel, two New York City Subway stations, and St. Nicholas Greek Orthodox Church were destroyed or badly damaged. In total, in Manhattan, 25 buildings were damaged and all seven buildings of the World Trade Centre Complex had to be razed. Two additional buildings were later condemned: the Deutsche Bank Building across Liberty Street from the World Trade Centre complex, due to the uninhabitable, toxic conditions inside the office tower and Borough of Manhattan Community College's Fiterman Hall at 30 West Broadway due to extensive damage in the attacks. These buildings are both (as of September 2006) slated for deconstruction. Communications equipment such as broadcast radio, television and two-way radio antenna towers were damaged beyond repair. In Arlington County, a portion of the Pentagon was severely damaged by fire and one section of the building collapsed. According to the 9/11 Commission, approximately 16,000 people were below the impact zones in the World Trade Centre complex at the time of the attacks. The vast majority of those below the impact areas survived, evacuating before the towers collapsed. Nineteen Arab men boarded the four planes, five each on American Airlines Flight 11, United Airlines Flight 175 and American Airlines Flight 77, four on United Airlines Flight 93. Fifteen of the attackers were from Saudi Arabia, two from the United Arab Emirates, one from Egypt, and one from Lebanon. The group consisted of six core organizers, which included the four pilots, and thirteen others. Unlike many stereotypes of hijackers or terrorists, most of the attackers were educated and came from well-to-do backgrounds. Ramzi Binalshibh allegedly meant to take part in the attacks, but he was repeatedly denied a visa for entry into the U.S.
Mohamed al-Kahtani, a Saudi Arabian citizen, may also have been planning to join the hijackers but U.S. Immigration authorities at Orlando International Airport refused his entry into the U.S. in August, 2001. He was later captured in Afghanistan and imprisoned at the U.S. military prison known as Camp X-Ray at Guantanamo Bay, Cuba. Zacarias Moussaoui was reportedly considered as a replacement for Ziad Jarrah, who at one point threatened to withdraw from the scheme because of tensions amongst the plotters. Plans to include Moussaoui were never completed because the al-Qaeda hierarchy allegedly had doubts about his reliability. He was arrested on August 16, 2001, about four weeks before the attacks, ostensibly for an immigration violation, but FBI agents suspected he had violent intentions after receiving flight training earlier that year. In April 2005, Moussaoui pleaded guilty to conspiring to hijack planes, and to involvement with al-Qaeda, but he denies foreknowledge of the 9-11 attacks. Moussaoui, at his sentencing hearing in March 2006, claimed that, upon the personal directive of Osama bin Laden, he and Richard Reid were due to hijack a fifth plane and fly it into the White House. His defense lawyers dismissed this as fantasy on the part of Moussaoui, saying that he was not an operative in al Qaeda, but only a "hanger-on." In a video tape released in May 2006, Osama bin Laden claimed that Moussaoui had "no connection whatsoever with the events of September 11" and that he knows this because "I was responsible for entrusting the 19 brothers" who carried out the attacks. On May 3, 2006, a federal jury rejected the death penalty and sentenced Moussaoui to 6 life terms in prison without parole. At Moussaoui's sentencing trial, FBI agent Greg Jones testified that prior to the attacks, he urged his supervisor, Michael Maltbie, "to prevent Zacarias Moussaoui from flying a plane into the World Trade Centre." Maltbie had refused to act on 70 requests from another agent, Harry Samit, to obtain a warrant to search Moussaoui's computer. Other al-Qaeda members who may have attempted, but were unable, to take part in the attacks include Saeed al-Ghamdi (not to be confused with the successful hijacker of the same name), Mushabib al-Hamlan, Zakariyah Essabar, Ali Abdul Aziz Ali, and Tawfiq bin Attash. According to the 9/11 Commission Report, Khalid Sheikh Mohammed, the attack's mastermind, wanted to remove at least one member — Khalid al-Mihdhar—from the operation, but he was overruled by Osama bin Laden. Within hours of the attacks, the FBI was able to determine their names and in many cases details such as dates of birth, known and/or possible residences, visa status, and specific identity of the suspected pilots and hijackers. Few had made any attempt to disguise their names on flight and credit card records, and they were some of the few people of Arabic descent on the flights. On the day of the attacks, U.S. intelligence agencies intercepted communications that pointed to Osama bin Laden. On September 27, 2001, the FBI released photos of the 19 hijackers, along with information about the possible nationalities and aliases of many. The FBI investigation into the September 11, 2001 attacks, code named operation PENTTBOM, was the largest and most complex investigation in the history of the FBI, involving over 7,000 special agents. The United States government determined that al-Qaeda, headed by Osama bin Laden, bore responsibility for the attacks, with the FBI stating that evidence linking Al-Qaeda and bin Laden to the attacks of September 11 is clear and irrefutable. The Government of the United Kingdom reached the same conclusion, regarding Al Qaeda and Osama bin Laden's culpability for the September 11, 2001 attacks. Osama bin Laden's declaration of a holy war against the United States, and a Fatwa signed by bin Laden and others calling for the killing of American civilians in 1998, are seen by many as evidence of his motivation to commit such acts. Bin Laden initially denied, but later admitted involvement in the incidents. On September 16, 2001, bin Laden denied any involvement with the attacks by reading a statement which was broadcast by Qatar's Al Jazeera satellite channel: "I stress that I have not carried out this act, which appears to have been carried out by individuals with their own motivation." This denial was broadcast on U.S. news networks and worldwide. In November 2001, U.S. forces recovered a videotape from a destroyed house in Jalalabad, Afghanistan, in which Osama bin Laden is talking to Khaled al-Harbi. In the tape bin Laden admits foreknowledge of the attacks. The tape was broadcast on various news networks from December 13, 2001. On December 27, 2001, a second bin Laden video was released. In the video he stated "Terrorism against America deserves to be praised because it was a response to injustice, aimed at forcing America to stop its support for Israel, which kills our people," but he stopped short of admitting responsibility for the attacks. Shortly before the U.S. presidential election in 2004 in a taped statement, bin Laden publicly acknowledged al-Qaeda's involvement in the attacks on the U.S, and admitted his direct link to the attacks. He said that the attacks were carried out because, "We are a free people who do not accept injustice, and we want to regain the freedom of our nation." In a videotape aired on Al Jazeera on October 30, 2004, bin Laden said he had personally directed the 19 hijackers. Another video obtained by Al Jazeera in September 2006 shows Osama bin Laden with Ramzi Binalshibh, as well as two hijackers, Hamza al-Ghamdi and Wail al-Shehri, as they make preparations for the attacks. The National Commission on Terrorist Attacks upon the United States was formed by the United States government and was commonly called the 9/11 Commission. It released its report on July 22, 2004, concluding that the attacks were conceived and implemented by members of al-Qaeda. The Commission stated that, "9/11 plotters eventually spent somewhere between $400,000 and $500,000 to plan and conduct their attack, but that the specific origin of the funds used to execute the attacks remained unknown. To date, only peripheral figures have been tried or convicted in connection with the attacks. In "Substitution for Testimony of Khalid Sheik Mohammed" from the trial of Zacarias Moussaoui, five people are identified as having been completely aware of the operations details. They are: Osama bin Laden, Khalid Sheik Mohammed, Ramzi Binalshibh, Abu Turab Al-Urduni and Mohammed Atef. On September 26th of 2005, the Spain's high court directed by judge Baltazar Garzon sentenced Abu Dahdah to 27 years of imprisonment for conspiracy on the 9/11 attacks and as part of the terrorist organization Al Qaeda. At the same time, another 17 Al Qaeda members were sentenced to penalties of between 6 and 12 years. On February 16th 2006, the Spanish Supreme Court reduced the Abu Dahdah penalty to 12 years because it considered that his participation in the conspiracy was not proven. According to official U.S. government sources, the September 11th attacks were consistent with the mission statement of al-Qaeda. The overarching motivation for the present al-Qaeda campaign was set out in a 1998 fatwa issued by Osama bin Laden, Ayman al-Zawahiri, Abu-Yasir Rifa'i Ahmad Taha, Shaykh Mir Hamzah, and Fazlur Rahman (Amir of the Jihad Movement in Bangladesh, Fazlur Rahman). U.S. military occupation of the Arabian Peninsula. U.S. aggression against the Iraqi people. Plunders the resources of the Arabian Peninsula. Dictates policy to the rulers of those countries. Supports abusive regimes and monarchies in the Middle East, thereby oppressing their people. Has military bases and installations upon the Arabian Peninsula, which violates the Muslim holy land, in order to threaten neighboring Muslim countries. Intends thereby to create disunion between Muslim states, thus weakening them as a political force. Supports Israel, and wishes to divert international attention from (and tacitly maintain) the occupation of Palestine. The Persian Gulf War, the ensuing sanctions against Iraq and the bombing of Iraq by the United States were cited in 1998 as further proof of these allegations. To the disapproval of moderate and liberal Muslims, the fatwa uses Islamic texts to exhort violent action against American military and citizenry until the alleged grievances are reversed: Stating "ulema have throughout Islamic history unanimously agreed that the jihad is an individual duty if the enemy destroys the Muslim countries." Statements of al-Qaeda recorded after 9/11 add weight to the U.S account of who was responsible for the attacks. In a 2004 video, apparently acknowledging responsibility for the attacks, bin Laden states that he was motivated by the 1982 Lebanon War, for which he held the U.S. partially responsible. In the video, bin Laden also claims that he wants to, "restore freedom to our nation," to "punish the aggressor in kind," and to inflict economic damage on America. He declared that a continuing objective of his holy war was to, "[bleed] America to the point of bankruptcy." Bin Laden said, "We swore that America wouldn't live in security until we live it truly in Palestine. This showed the reality of America, which puts Israel's interest above its own people's interest. America won't get out of this crisis until it gets out of the Arabian Peninsula, and until it stops its support of Israel." The 9/11 Commission Report determined that the animosity towards the United States felt by Khalid Shaikh Mohammed, the "principal architect" of the 9/11 attacks, stemmed "not from his experiences there as a student, but rather from his violent disagreement with U.S. foreign policy favoring Israel." The same motivation has been imputed to the two pilots who flew into the WTC: Mohamed Atta was described by Ralph Bodenstein—who traveled, worked and talked with him—as "most imbued actually about... U.S. protection of these Israeli politics in the region." Marwan al-Shehhi is said to have explained his humorless demeanor with the words: "How can you laugh when people are dying in Palestine?" By contrast, the Bush administration says that Al-Qaeda was motivated by hatred of the freedom and democracy exemplified by the United States. According to counter-terrorism expert Richard A. Clarke, internal political conflicts within the Muslim world are the primary causal factors for the attacks of 9/11. Specifically, bin Laden and other residents of Saudi Arabia and Egypt, among other countries of the Middle East, believe that the vast majority of governments in the Middle East are apostate governments. That is, these governments' collective religiosity does not meet bin Laden's standard of Muslim piety. The primary reason that bin Laden gives for this assertion is that none of these governments is a caliphate. Inspired by the Egyptian theologian and writer Sayyid Qutb, bin Laden believes that it is his duty as a Muslim to establish a caliphate in the Middle East. Arising directly from these beliefs, bin Laden designed a strategy of attacking the United States in order to establish this caliphate. Terming the United States as the "Far Enemy," bin Laden designed the attacks of 9/11 to cause the U.S. to increase its military and cultural presence in the Middle East. Bin Laden believes that once Muslim citizens of the Middle East confront the evils of a non-Muslim government, one that is not a caliphate, a popular social and political movement will catalyze around the desire for very conservative and zealous Muslim governments in the Middle East. According to Michale Doran, this goal is further demonstrated by bin Laden's use of the term "spectacular" as a noun when talking about the attacks of 9/11. For example, "This spectacular will greatly anger America." He hoped these attacks would provoke a visceral emotional response from the government and citizens of the United States. In so doing, he was attempting to ensure that Muslim citizens in the Middle East would react as violently as possible to an increase in U.S. involvement in their region. Mohammed Afroze was convicted in India in 2005 after confessing to being involved in planning an attack on the Palace of Westminster in London and Tower Bridge. The attack was aborted at the last minute when the would-be hijackers, waiting to board the planes they were to hijack, saw the damage in the U.S., panicked, and fled. His lawyer claimed that the confession was obtained through torture. In February 2006, President George W. Bush stated that al-Qaeda had initially planned to crash a plane into the tallest building in the western United States, the Library Tower in Los Angeles, on the same day. However, this attack was postponed by bin Laden, and subsequently foiled. The U.S. government initially claimed that the White House and Air Force One were also targeted, although the source and nature of these threats was not disclosed. President Bush flew on Air Force One to Barksdale Air Force Base in Louisiana, and then flew to Offutt Air Force Base in Nebraska, before returning to Washington. After criticism that Bush did not return immediately to Washington, the White House claimed the next day that a terrorist threat, "using code words," had been phoned in against Air Force One. White House Spokesman Ari Fleischer quoted the caller as saying, "Air Force One is a target." The White House later backed away from this claim after no evidence of the phone call was found. 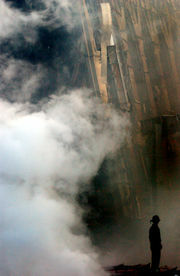 A solitary firefighter stands amid the rubble and smoke in New York City. Days after the Sept. 11 attack, fires still burned at the site of the World Trade Centre. The attacks had major global political ramifications. They were denounced by mainstream media and governments worldwide, with the headline of France's Le Monde newspaper summing up the international mood of sympathy: "We Are All Americans" (Nous sommes tous Américains). The German reaction was profound and remains so, five years later, in 2006. The most publicized exception was that some Palestinians celebrated jubilantly upon hearing about 9/11. Less publicized are the public demonstrations of enthusiasm for the attacks conducted by Chinese students in mainland China during the night after the attacks. 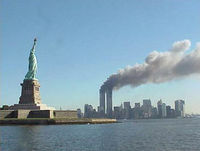 Approximately one month after the attacks, the United States led a broad coalition of international forces in the removal of the oppressive Taliban regime for harboring the al-Qaeda organization. The Pakistani authorities moved decisively to align themselves with the United States in a war against the Taliban and al-Qaeda. Pakistan provided the U.S. a number of military airports and bases for its attack on the Taliban regime, and arrested over 600 supposed al-Qaeda members, whom it handed over to the U.S. Numerous countries, including the UK, India, Australia, France, Germany, Indonesia, China, Canada, Russia, Pakistan, Jordan, Mauritius, Uganda and Zimbabwe introduced "anti-terrorism" legislation and froze the bank accounts of businesses and individuals they suspected of having al-Qaeda ties. Law enforcement and intelligence agencies in a number of countries, including Italy, Malaysia, Indonesia, and the Philippines arrested people they labeled terrorist suspects for the stated purpose of breaking up militant cells around the world. In the U.S., this aroused some controversy, as critics such as the Bill of Rights Defense Committee argued that traditional restrictions on federal surveillance (e.g. COINTELPRO's monitoring of public meetings) were "dismantled" by the USA PATRIOT Act; civil liberty organizations such as the American Civil Liberties Union and Liberty argued that certain civil rights protections were also being circumvented. The United States set up a detention centre at Guantanamo Bay, Cuba, to hold what they termed " illegal enemy combatants". The legitimacy of these detentions has been questioned by, among others, member states of the European Union, the Organization of American States, and Amnesty International. In the United Kingdom outrage swelled in the media over a Civil Servant's attempt to capitalize on the tragedy. Jo Moore, then serving Minister Stephen Byers, sent an email to staff suggesting that it would be a good time to publish anything that may prove unpopular in the hope that it would be overshadowed by events in the U.S. This political storm became known as the Bury Bad News Scandal. The 9/11 attacks had immediate and overwhelming effects upon the United States population. Gratitude toward uniformed public-safety workers (dubbed " first responders"), and especially toward firefighters, was widely expressed in light of both the drama of the risks taken on the scene and the high death toll among the workers. Many police officers and rescue workers elsewhere in the country took leaves of absence to travel to New York City to assist in the grim process of recovering bodies from the twisted remnants of the Twin Towers. Blood donations also saw a surge in the weeks after 9/11. There were some incidents of harassment and hate crimes against Middle Easterners and other, "Middle Eastern-looking" people, particularly Sikhs, due to the fact that Sikh males usually wear turbans, which are stereotypically associated with Muslims in the United States. At least nine people were murdered within the United States as a result. Balbir Singh Sodhi, one of the first victims of this phenomenon, was fatally shot on September 15. He, like others, was a Sikh who was mistaken for a Muslim. Following the September 11, 2001 attacks, George W. Bush's job approval rating soared to 86%. 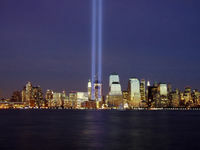 On September 20, 2001, the president spoke before the nation and a joint session of the United States Congress, regarding the events of that day, the intervening nine days of rescue and recovery efforts, and his intent in response to those events. In addition, the highly visible role played by New York City mayor Rudy Giuliani won him high praise nationally and in New York. Various conspiracy theories have emerged that question the mainstream account of the attacks. Conspiracy theorists have said the collapse of the World Trade Centre was caused by planted explosives. Some say a commercial airliner did not crash into the Pentagon, and that United Airlines Flight 93 was shot down. Most conspiracy theories say individuals in the government of the United States knew of the impending attacks and let them happen, or actually planned the attacks. While conspiracy theories about Jewish or Israeli involvement are "a core part of the belief system of anti-Semites and millions of others around the world", in the United States a minority of conspiracy theorists say there was Israeli or Jewish involvement in the attacks. Within hours of the attack, a massive search and rescue (SAR) operation was launched, which included over 350 search and rescue dogs. 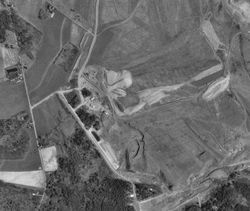 Initially, only a handful of wounded people were found at the site, and in the weeks that followed it became evident that there were no survivors to be found. Rescue and recovery efforts took months to complete. 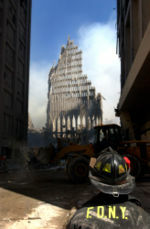 It took several weeks to simply put out the fires burning in the rubble of the buildings, and the clean-up was not completed until May, 2002. Temporary wooden "viewing platforms" were set up for tourists to view construction crews clearing out the gaping holes where the towers once stood. All of these platforms were closed on May 30, 2002. Many relief funds were immediately set up to assist victims of the attacks, with the task of providing financial assistance to the survivors and the families of victims. At the deadline for victim's compensation, September 11, 2003, 2,833 applications were received from the families of those massacred. In the aftermath of the attacks, many U.S. citizens held the view that the attacks had "changed the world forever." The Bush administration declared a war on terrorism, with the stated goals of bringing Osama bin Laden and al-Qaeda to justice and preventing the emergence of other terrorist networks. These goals would be accomplished by means including economic and military sanctions against states perceived as harboring terrorists and increasing global surveillance and intelligence sharing. The second-biggest operation outside of the United States was the overthrow of the oppressive Taliban rule from Afghanistan, by a U.S.-led coalition. The U.S. was not the only nation to increase its military readiness, with other notable examples being the Philippines and Indonesia, countries that have their own internal conflicts with Islamic extremist terrorism. Because the attacks on the United States were judged to be within the parameters of its charter, NATO declared that Article 5 of the NATO agreement was satisfied on September 12, 2001, making the US war on terror the first time since its inception that NATO would actually participate in a "hot" war. Within the United States, Congress passed and President Bush signed the Homeland Security Act of 2002, creating the Department of Homeland Security, representing the largest restructuring of the U.S. government in contemporary history. Congress passed the USA PATRIOT Act, stating that it would help detect and prosecute terrorism and other crimes. Civil liberties groups have criticized the PATRIOT Act, saying that it allows law enforcement to invade the privacy of citizens and eliminates judicial oversight of law-enforcement and domestic intelligence gathering. The Bush Administration also invoked 9/11 as the reason to initiate a secret National Security Agency operation, "to eavesdrop on telephone and e-mail communications between the United States and people overseas without a warrant." Following the attacks, 80,000 Arab and Muslim immigrants were fingerprinted and registered under the Alien Registration Act of 1940. 8,000 Arab and Muslim men were interviewed, and 5,000 foreign nationals were detained under Joint Congressional Resolution 107-40 authorizing the use of military force "to deter and prevent acts of international terrorism against the United States." 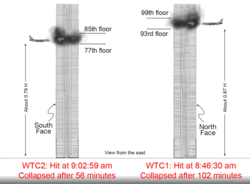 An illustration of the World Trade Centre 9-11 attacks with a vertical view of the impact locations. Many architects and structural engineers have analyzed the collapse of the Twin Towers. September 13, 2001: A New York City firefighter looks up at what remains of the South Tower. 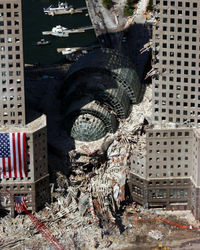 Three buildings in the World Trade Centre Complex collapsed due to structural failure on the day of the attack. The south tower (2 WTC) fell at approximately 9:59 a.m., after burning for 56 minutes in a fire caused by the impact of United Airlines Flight 175 at 9:03 a.m. The north tower (1 WTC) fell at 10:28 a.m., after burning approximately 102 minutes in a fire caused by the impact of American Airlines Flight 11 at 8:46 a.m. A third building, 7 World Trade Centre (7 WTC) collapsed at 5:20 p.m., after being heavily damaged by debris from the Twin Towers when they fell and subsequent fires. Numerous adjacent buildings to the complex also had substantial damage and fires and had to be demolished. The Deutsche Bank Building is the only remaining large structure that suffered damage and fires at ground zero that has yet to be fully demolished, though this is expected to be completed by mid 2007. The report concludes that the fireproofing on the Twin Towers' steel infrastructures was blown off by the initial impact of the planes and that, if this had not occurred, the towers would likely have remained standing. The fires weakened the trusses supporting the floors, making the floors sag. The sagging floors pulled on the exterior steel columns to the point where exterior columns bowed inward. With the damage to the core columns, the buckling exterior columns could no longer support the buildings, causing them to collapse. In addition, the report asserts that the towers' stairwells were not adequately reinforced to provide emergency escape for people above the impact zones. NIST stated that the final report on the collapse of 7 WTC will appear in a separate report. 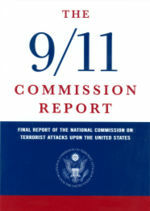 The National Commission on Terrorist Attacks Upon the United States ( 9/11 Commission), chaired by former New Jersey Governor Thomas Kean, was formed in late 2002 to prepare a full and complete account of the circumstances surrounding the attacks, including preparedness for, and the immediate response to, the attacks. On July 22, 2004, the report was released. The commission has been subject to criticism. For the first time in history, all nonemergency civilian aircraft in the United States and several other countries including Canada were immediately grounded, stranding tens of thousands of passengers across the world. Contingency plans for the continuity of government and the evacuation of leaders were implemented almost immediately after the attacks. Congress, however, was not told that the US was under a continuity of government status until February 2002. The attacks had a significant economic impact on the United States and world markets. The Federal Reserve temporarily had reduced contact with banks because of outages of switching equipment in the lower NY financial district. Contact and control over the money supply, including immediate liquidity for banks, was restored within hours. The New York Stock Exchange (NYSE), the American Stock Exchange and NASDAQ did not open on September 11 and remained closed until September 17. NYSE facilities and remote data processing sites were not damaged by the attack, but member firms, customers and markets were unable to communicate due to major damage to the telephone exchange facility near the World Trade Centre. When the stock markets reopened on September 17, 2001, after the longest closure since the Great Depression in 1929, the Dow Jones Industrial Average (“DJIA”) stock market index fell 684 points, or 7.1%, to 8920, its biggest-ever one-day point decline. By the end of the week, the DJIA had fallen 1369.7 points (14.3%), its largest one-week point drop in history. U.S. stocks lost $1.2 trillion in value for the week. As of 2005 Wall and Broad Streets near the New York Stock Exchange remained barricaded and guarded to prevent a physical attack upon the building. The economy of Lower Manhattan, which by itself is the third-largest business district in the United States (after Midtown Manhattan and the Chicago Loop) was devastated in the immediate aftermath. 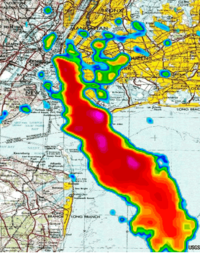 Thirty percent (28.7 million sq ft, 2.7 million m³) of Lower Manhattan office space was either damaged or destroyed. The 41-story Deutsche Bank Building, neighboring the World Trade Centre, was subsequently closed because extensive damage made it unfit for habitation and beyond repair; it was scheduled for demolition. Power, telephone, and gas were cut off in much of Lower Manhattan. People were not permitted to enter the SoHo and Lower Manhattan area without extensive inspection. Much of what was destroyed was valuable Class-A space. The pre-2001 trend of moving jobs out of Lower Manhattan to Midtown and New Jersey was accelerated. Many questioned whether these lost jobs would ever be restored, and whether the damaged tax base could ever recover. The rebuilding has been inhibited by a lack of agreement on priorities. For example, Mayor Bloomberg had made New York's bid for the 2012 Summer Olympics the core of his capital development plan from 2002 until mid-2005, and Governor Pataki largely delegated his role to the Lower Manhattan Development Corporation which has been widely criticized for doing little with the enormous funding directed to the rebuilding efforts. On the sites of the totally destroyed buildings, one, 7 World Trade Centre, has a new office tower which was completed in 2006. The Freedom Tower is currently under construction at the site and at 1,776 ft (541 m) upon completion in 2010, will become the tallest building in North America and one of the tallest in the world. Three more towers are expected to be built between 2007 and 2012 on the site, and will be located one block east of where the original towers stood. North American air space was closed for several days after the attacks and air travel decreased significantly upon its reopening. The attacks led to nearly a 20% cutback in air travel capacity, and severely exacerbated financial problems in the struggling U.S. airline industry. The thousands of tons of toxic debris resulting from the collapse of the Twin Towers consisted of more than 2,500 contaminants, more specifically: 50% nonfibrous material and construction debris; 40% glass and other fibers; 9.2% cellulose; and 0.8% asbestos, lead, and mercury. There were also unprecedented levels of dioxin and PAHs from the fires which burned for three months. Some of the dispersed substances (crystalline silica, lead, cadmium, polycyclic aromatic hydrocarbons) are carcinogenic; other substances can trigger kidney, heart, liver and nervous system deterioration. This has led to debilitating illnesses among rescue and recovery workers, and the death of NYPD officer James Zadroga. Health effects also extended to some residents, students, and office workers of Lower Manhattan and nearby Chinatown. There is scientific speculation that exposure to various toxic products and the pollutants in the air surrounding the Towers after the WTC collapse may have negative effects on fetal development. Due to this potential hazard, a notable children's environmental health center is currently analyzing the children whose mothers were pregnant during the WTC collapse, and were living or working near the World Trade Centre towers. The staff of this study assesses the children using psychological testing every year and interviews the mothers every six months. The purpose of the study is to determine whether there is significant difference in development and health progression of children whose mothers were exposed, versus those who were not exposed after the WTC collapse. Government officials have been faulted for urging the public to return to lower Manhattan in the weeks shortly following the attacks. President Bush has been faulted for interfering with the EPA interpretations and pronouncements regarding air quality. Mayor Giuliani has been faulted for urging financial industry personnel to return to the greater Wall Street area. On October 17, 2006 federal judge Alvin K. Hellerstein rejected New York city's refusal to pay for health costs for rescue workers. Memorials to the victims and heroes of the attacks of September 11 have been planned. An eternal flame was lit by the Mayor on the first anniversary of the disaster. An outdoor public memorial at the Pentagon is scheduled for completion in Fall 2006. Within the Pentagon itself, the America's Heroes Memorial was added in September, 2002 when the building repairs were completed. However, public access to this memorial is restricted to group tours. The proposed design for Flight 93 National Memorial is called, "Crescent of Embrace," which has created some controversy due to its large red crescent that also points toward Mecca. Recently, due to the amount of public pressure, it has been announced that the memorial will be redesigned so as to avoid any confusion with the sign of Islam. 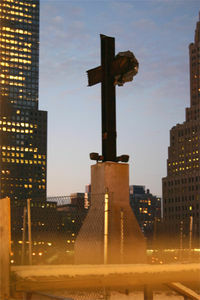 Construction of the World Trade Centre Memorial began in March 2006. The winning design of the World Trade Centre Site Memorial Competition was Reflecting Absence created by Michael Arad. It is expected to open in 2009. Many permanent memorials are being constructed around the world and a list is being updated as new ones are completed. In addition to physical monuments, a number of September 11th family members and friends have set up memorial funds, scholarships, and charities in honour of lost loved ones.